The open- plan bathroom is still tremendously popular. Not only is space a requirement for clients but modern bathrooms should be able to give users a sensual experience. Gone are the days where bathrooms serve a functional purpose only. The interior design of this bathroom is completed with beautiful high gloss porcelain tiles that give it a very contemporary look. When it comes to a luxury feel, our client opted for bigger is better. Opulence is created when bathrooms are more spacious. The vanity is the focal point of the bathroom when you walk into the space. It also allows for plenty of storage. This space has all the benefits of heated towel rails and a luxury spa bath. The bathroom certainly meets the design brief of the client for absolute luxury and enjoyment. 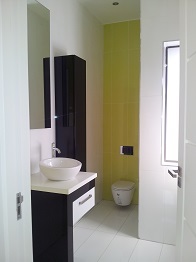 This gorgeously, modern toilet adds zing to the room with the use of citrus yellow high gloss tiles. All the features float giving the visual appeal of space, clean lines and minimal elements. Our client certainly does not believe in taking a white or natural approach to their bathrooms but the use of coloured tiles speaks of their vibrant personalities. The colour is energizing and refreshing. It is offset with the glossy black and this adds drama to the space. 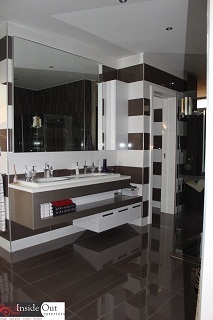 The latest cutting edge mirror polished stainless steel bathroom fittings have been used.